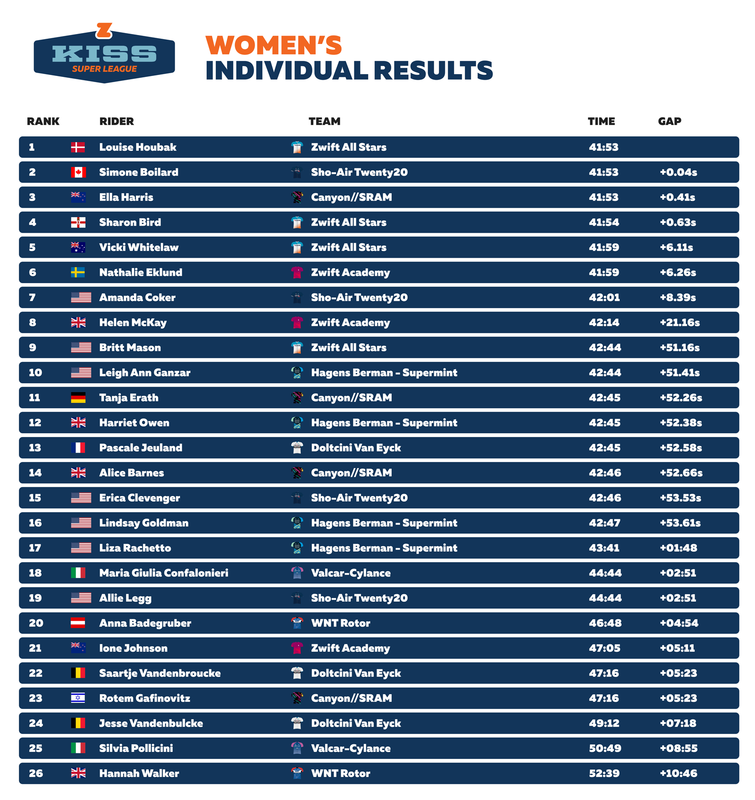 Strong attacks and a nail-biting chase led to a photo finish in the first race of the women’s KISS Super League. 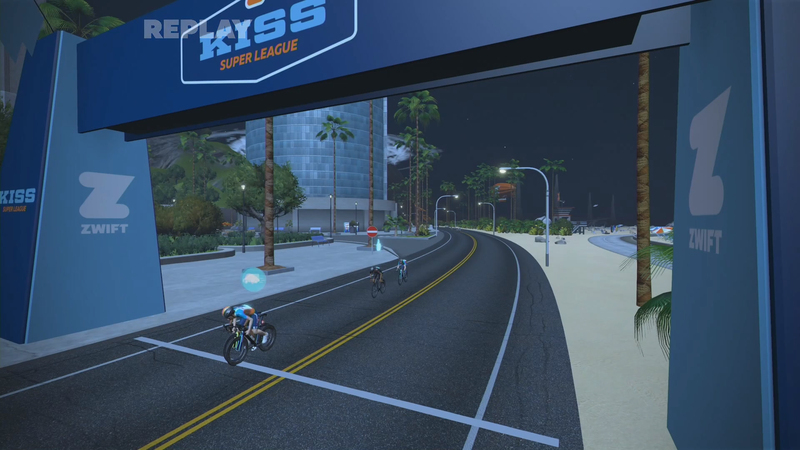 For their first stage KISS Super League, the women competed on three laps of the Watopia Flat course for a total distance of just over 30 kilometers. It features mostly flat terrain, but a series of short, rolling hills toward the end of each lap can catch riders off-guard – or serve as a launch pad for attacks. The fast start of the race only caught a few riders out, and most of the peloton stayed together on lap one. A surge on a short, sharp hill just past the first intermediate sprint shed several riders off the back, leaving just 19 racers in the peloton going into the second lap. At first, it looked like the race may come down to a bunch sprint. But after the second intermediate sprint, Simone Boilard (Sho-Air Twenty20) attacked up the hill with an aero helmet PowerUp. Several others followed, and the peloton stretched and split. Nine racers at the front got a gap on the rest behind. 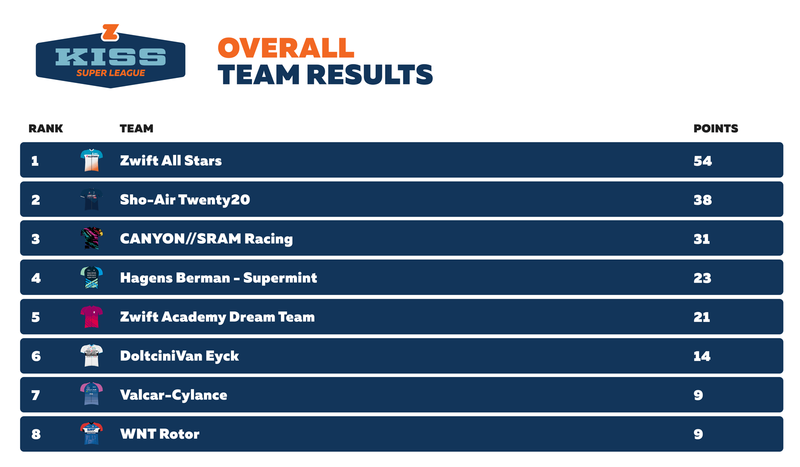 The lead group included three riders from Sho-Air Twenty20, three from the Zwift All Stars, two from the Zwift Academy Dream Team, and one from Canyon//SRAM. 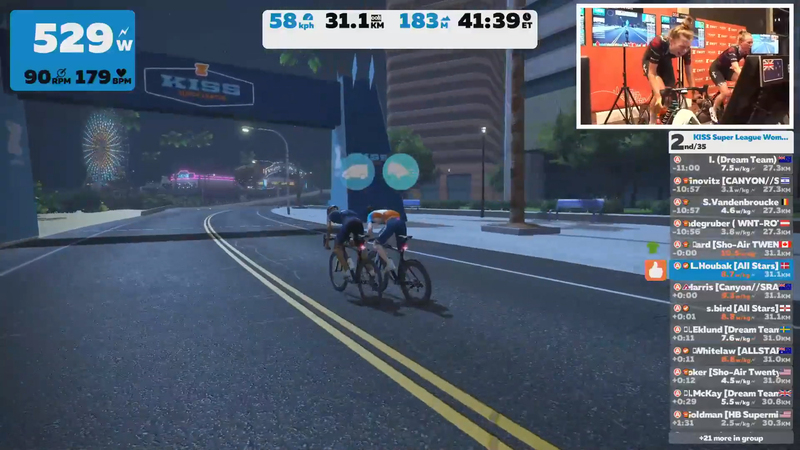 The Zwift All Stars worked to increase their lead. Meanwhile, Canyon//SRAM organized to take up the chase behind. They knew the whole team needed to finish as high as possible to get the most points in the team competition. As the racers entered the final lap, Tanja Erath (Canyon//SRAM) put in a massive dig to get the gap down to two seconds. But just then, Erica Clevenger (Sho-Air Twenty20) attacked off the front. The leaders sped up to catch her, and the gap to the chase group started growing again. After Clevenger was caught in front, Hagens Berman – Supermint took up the chase behind. Helen McKay (Zwift Academy Dream Team) went all-in to claim the third intermediate sprint near the end of the race. The stage included a competition that awarded riders points for their position across the sprint banner on each lap. McKay crossed first on two out of three laps, winning the battle for the intermediate sprint competition. McCay’s acceleration did more than give her the sprinting title. 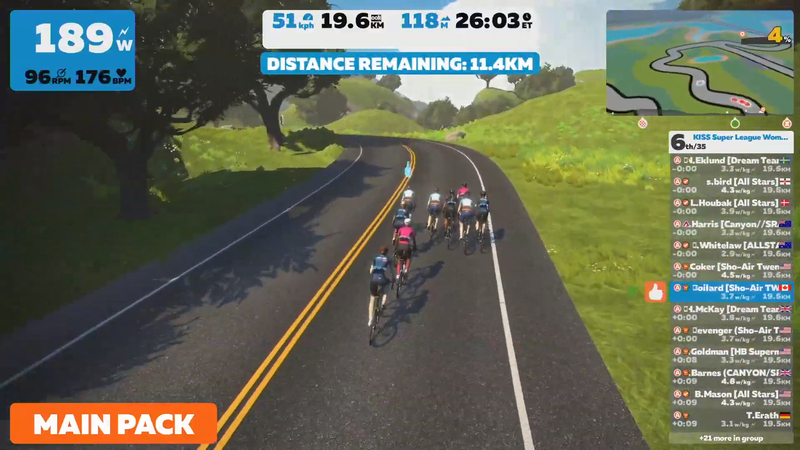 It gave the Zwift All Stars a boost in speed for a hard attack up the short hill, going into the last stretch of rolling terrain. The group broke apart! 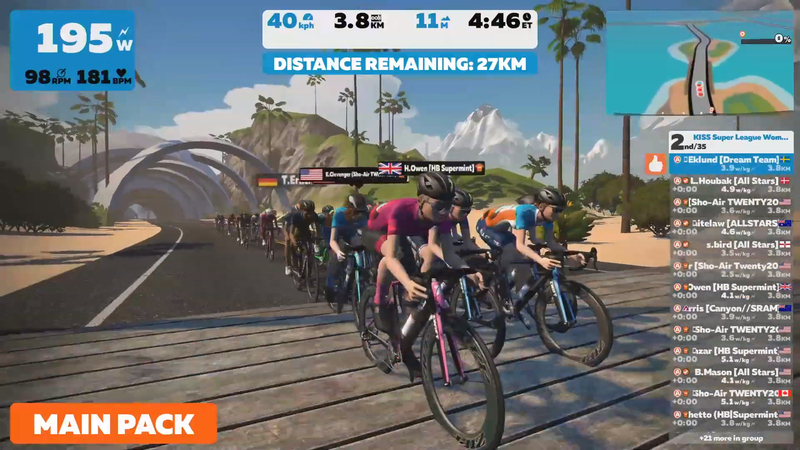 Sharon Bird (Zwift All Stars), Louise Houbak (Zwift All Stars), Ella Harris (Canyon//SRAM) and Simone Boilard (Sho-Air Twenty20) formed a breakaway with just 1.5 km to go. The remains of the lead group trailed closely behind. Coming up to the finish line, Houbak hit an aero helmet PowerUp and accelerated. Just behind her, Boilard used a draft truck PowerUp to get a stronger slipstream effect. Boilard slingshotted out in front and Houbak responded as the two sprinted ahead of the others for the line. Houbak barely came around to win by the width of a tire. Thanks to their riders’ high placings, the Zwift All Stars now lead the overall team competition. “We wanted to put some pressure on the small hills to see the power of the others, and to go for sprint points for our sprinter,” Houbak said. “Then to save power until the end and get the greatest team result. After the race, Houbak said she’s honored to be racing for the Zwift All Stars and is thrilled that both she and the team took first place. She said the team’s experience with Zwift racing helped their strategy. They weren’t sure how much experience the other riders had, so they kept testing them at points on the course where the race could break apart. Among the pro teams, Sho-Air Twenty20 showed that they came prepared. Harris was the last rider to break away with the top four riders, putting down a huge effort to reach the front. She raced alongside her Canyon-SRAM teammates at a live event in Koblenz, Germany, while fans and friends cheered them on. Tune in live next Tuesday to see all the action!